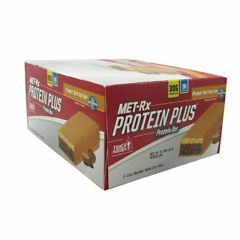 AllegroMedical.com presents The MET-Rx Protein Plus - Peanut Butter Cup Meal Replacement Bar. MET-Rx's Peanut Butter Cup Protein Plus bar contains the exclusive METAMYOSYN protein formula and rich taste. Packed with 30 - 32 grams of protein, depending on flavor, the protein plus protein bar is perfect for supporting muscle and an active lifestyle. 30g protein per serving, 3g of sugar, Naturally flavored, Includes Metamyosyn protein! Cocoa Crisps (Soy Protein Isolate, Cocoa [processed with alkali], Tapioca Starch), Maltitol Syrup, Metamyosyn® VPP Protein Blend (Whey Protein Isolate, Casein, Hydrolyzed Whey Protein Isolate, Calcium Caseinate, Egg White, L-Glutamine), Maltitol, Fractionated Palm Kernel Oil, Partially Defatted Peanut Flour, Glycerin, Sorbitol, Milk Protein Isolate, Cocoa (processed with alkali), Natural Flavors, Polydextrose, High Oleic Sunflower Oil, Water, Cocoa Filling (Fructose, Water, Maltodextrin, Cocoa [processed with alkali], Salt, Carrageenan, Natural Flavors, Tocopherol, Ascorbic Acid), Unsweetened Chocolate, Enzyme Modified Soy Protein, Soy Protein Isolate, Vitamin and Mineral Blend (Calcium Carbonate, Magnesium Oxide, Ascorbic Acid, Ferric Orthophosphate, dl-Alpha Tocopheryl Acetate, Niacinamide, Zinc Oxide, Copper Gluconate, d-Calcium Pantothenate, Vitamin A Palmitate, Pyridoxine Hydrochloride, Thiamin Mononitrate, Riboflavin, folic acid, biotin,potassium iodide, cyanocobalamine), Sodium caseinate, salt, maltodextrin, pectin, calcium lactate, sugar, soy lecithin, sucralose, tartartric acid, mixed tocopherols (added to protect flavor), soybean oil, caramel color.